U.S stocks snapped higher yesterday as markets eased some of the month’s brutal losses before the end of October. The S&P 500 rallied more than 1.5 percent to close at 2,682.63 as communications, energy and materials stocks carried the index out of correction territory. Shares of Charter Communications, DISH Network and Twitter all rose more than 4 percent each. The Dow Jones Industrial Average surged by 431.72 points. Goldman Sachs, McDonald’s and Boeing all outperformed the broader blue-chip index. The tech-heavy NASDAQ rose more than 1.5 percent. That index climbed thanks to a 5.2-percent rally in Intel. The rebound on Tuesday followed a shaky start to the week in the prior session that saw stocks giving up sharp gains. The Dow traveled more than 900 points on Monday. Market participants cited the possibility of more U.S.-China tariffs, a drop in tech stocks and worries over higher interest rates for the decline. After yesterday’s comeback, the Dow is down 5.9 percent this month, still its worst performance since August 2015. The Dow Jones Industrial Average gained 1.77% yesterday. 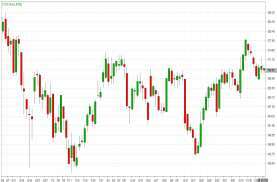 The best performers of the session on the Dow Jones Industrial Average were Intel Corporation, which rose 5.20% or 2.36 points to trade at 47.76 at the close. 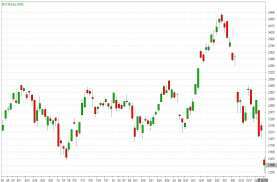 Meanwhile, Boeing Co added 4.27% or 14.32 points to end at 349.91 and Nike Inc. was up 3.21% or 2.32 points to 74.51 in late trade. The worst performers of the session were International Business Machines, which fell 3.54% or 4.24 points to trade at 115.40 at the close. Visa Inc. declined 1.17% or 1.57 points to end at 132.76 and Pfizer Inc. was down 0.79% or 0.34 points to 42.89. The tech heavy NASDAQ index climbed 1.58%. The top performers on the NASDAQ Composite were Electro Scientific Industries Inc. which rose 91.09% to 28.53, Heidrick & Struggles International which was up 23.88% to settle at 36.37 and Aptevo Therapeutics Inc. which gained 23.37% to close at 3.590. The worst performers were Avinger Inc. which was down 44.58% to 0.33 in late trade, Novume Solutions Inc. which lost 43.08% to settle at 0.74 and LM Funding America Inc. which was down 41.94% to 1.98 at the close. Gold prices fell to a more than two-week low today as equities gained and the dollar touched multi-month highs after upbeat economic data indicated a robust U.S economy. The yellow metal, however, remained on track to end a run of six straight monthly losses, the longest such streak since early 1997. Spot gold was 0.5 percent lower at $1,216.85 an ounce at 0750 GMT, having touched its lowest since Oct. 12 at $1,215.35 earlier in the session. It has risen more than 2 percent so far in October, the biggest monthly gain since January. U.S gold futures fell 0.5 percent to $1,218.7 an ounce. Gains in dollar is impacting dollar-denominated gold negatively. After robust recent economic data, the U.S. non-farm payroll data is also expected to be positive, so possibly dollar strengthening might continue for the next couple of days. The greenback today scaled 16-month highs versus its key rivals on continued strength in the U.S economy. Gold prices have slipped about 11 percent from their April peak as investors turned to the dollar as a safe-haven with the trade war unfolding against a backdrop of higher U.S. interest rates. A stronger dollar makes dollar-denominated bullion more expensive for users of other currencies while higher interest rates reduce the attraction of non-yielding gold. As long as inflation doesn’t become a real threat or equities plunge much further from current levels, many investors will prefer yielding instruments than investing in gold, and that’s what the dollar is providing. Gold is likely to trade within a narrow range of $1,200 – $1,250, until new factors emerge. It needs a bigger trigger to see another rally similar to the one seen since the beginning of the month. The market is also awaiting the verdict of next week’s U.S. mid-term elections for a direction. The midterm elections, on Nov. 6, will determine whether the Republican or Democratic Party controls the U.S Congress. Among other precious metals, silver was down 0.6 percent at $14.35 per ounce after falling to an over two-week low of $14.31 earlier in the day. Soybean futures slid to their lowest prices in about six weeks in yesterday’s session as advancing domestic harvests increased crop supplies. Corn and wheat futures also fell. The U.S Dollar traded higher against all of the major currencies except for the Australian and New Zealand dollars. Stronger than expected consumer confidence helped sustain the greenback’s gains but the bulk of rally occurred well before the data was released. Instead, it was the uptick in US bond yields, softer Eurozone data and BoE concerns that prevented EUR, GBP and JPY from rallying. The recovery in US stocks today was strong but the late day move was not driven by the consumer confidence index which hit an 18 year high. Weaker Eurozone data and German Chancellor Merkel’s decision to step down as chancellor in 2021 has made it difficult for EURO to rally. Not only did Eurozone confidence fall across the board with the business climate, industrial confidence and services confidence slipping but GDP growth also slowed unexpectedly in Q3. Economists had been looking for growth to remain steady at 0.4%, but instead the regional economy expanded by half that amount (0.2%) between July and September. Inflation is still on the rise according to German CPI but the lack of growth makes Draghi’s optimism a hard sell. Its time to turn your focus to the British pound because today, the Bank of England will release its Quarterly Inflation Report in conjunction with a monetary policy announcement. They are not expected to change interest rates but changes to their economic projections and the overall tone of the report will have a significant impact on the currency. Sterling dropped to a 2 month low versus the U.S. dollar today as the BoE’s Quarterly Inflation report and Governor Carney’s comments will determine whether the currency falls through its August lows or turns higher from here. The single currency has entered the new week on its back foot after the outcome of another regional election in Germany saw the single currency’s political headache turn into a migraine yesterday. The Euro has had a volatile start to the week, with the news that Angela Merkel is likely to leave her post in December shaking confidence in the region. 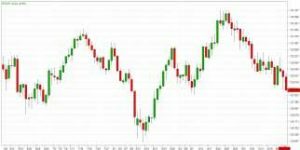 Overall, the USD/JPY traded with a low of 1.1339 and a high of 1.1386 before closing the day around 1.1342 in the New York session. 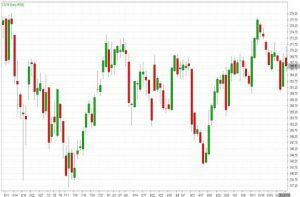 The Japanese Yen posted considerable losses in yesterday’s session, erasing Friday’s gains. On the release front, Japanese retail sales posted a strong gain of 2.1%, matching the forecast. In the U.S, the Core PCE Price Index gained 0.2%, edging above the estimate of 0.1%. Personal spending edged up to 0.4%, matching the forecast. Overall, the USD/JPY traded with a low of 112.28 and a high of 113.10 before closing the day around 113.09 in the U.S session. The British Pound fell against the U.S Dollar since breaching 1.2850 in late London and at the start of the North America trade as the dollar and risk appetite firms up. The Dollar has been finding a bid again with US stock markets battling back lost ground on Monday, following suit of a bounce in European bourses. . 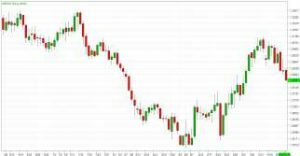 Overall, the GBP/USD traded with a low of 1.2694 and a high of 1.2810 before closing the day at 1.2704 in the New York session. The Canadian Dollar edged lower yesterday, trading in a narrow range as stocks rose and oil prices declined. Canada runs a current account deficit and exports many commodities, including oil, so its economy tends to benefit when capital flows freely. Still, concern over the global economy put crude on track for its biggest monthly fall since mid-2016. 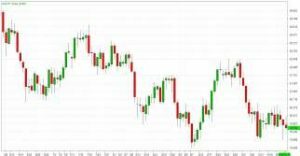 Overall, USD/CAD traded with a low of 1.3098 and a high of 1.3145 before closing the day at 1.3108 in the New York session. The Australian Dollar started the week lower against the U.S Dollar. Aussie has been hammered as risk sentiment took a knock following weakness in the Chinese Yuan. The RBA has held rates at 1.5 per cent since mid-2016 and markets imply only a 50-50 chance of a hike by December next year. 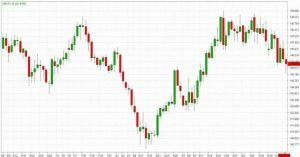 Overall, AUD/USD traded with a low of 0.7019 and a high of 0.7102 before closing the day at 0.7088 in the New York session. EUR/JPY is trading below 14 and above 50, 100 days moving average. Fast stochastic is giving a bullish tone and MACD is issuing a bearish stance. The Relative Strength Index is above 36 and lies below the neutral zone. In general, the pair has gained 0.41%. Currently, GBP/JPY is trading below 14 and above 50, 100 days moving average. Fast stochastic is issuing a bearish tone and MACD is also indicating a bearish stance. The Relative Strength Index is above 35 reading and lies below the neutral zone. On the whole, the pair has lost 0.02%. Currently, the cross is trading below 14, 50 and 100 days moving average. Fast stochastic is giving a bullish tone and MACD is indicating a bearish stance. The Relative Strength Index is above 39 reading and lies below the neutral region. In general, the pair has gained 1.36%. This cross is currently trading below 14, 50 and 100 days moving average. Fast stochastic is indicating a bullish tone and MACD is also issuing a bullish signal. The Relative Strength Index is above 58 and lies above the neutral region. On the whole, the pair has gained 0.44%. This cross is trading above 14, 50 and 100 days moving average. Fast stochastic is issuing a bearish stance and MACD is indicating a bullish tone. The Relative Strength Index is above 45 and lies above the neutral region. In general, the pair has lost 0.34%. Wall Street was back in aggressive sell-off mode on Friday, with major stock indices losing more than two percent following disappointing earnings announcement from Amazon and Google parent Alphabet. 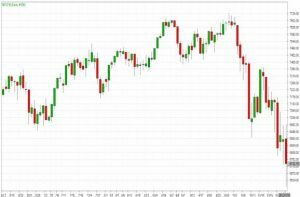 The Dow Jones Industrial Average fell 1.8% after earlier losing more than 2.0%, while the broad-based S&P 500 shed 2.4%. The tech-rich NASDAQ Index was down 2.1%. Both Amazon and Alphabet reported big jumps in quarterly profit but Amazon’s sales forecast for the critical holiday-shopping quarter disappointed analysts. Alphabet’s revenues in the just-finished quarter also lagged analyst forecasts. Amazon plummeted 9.2% while Alphabet slumped 4.8%. US government data, meanwhile, estimated third-quarter growth at a solid 3.5%, below the pace of the prior 4.2% quarter but better than expected. 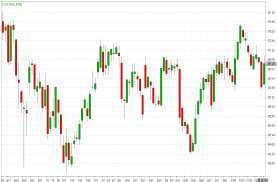 Friday’s weakness on Wall Street pushed the market back into the red where it has been for much of October, due in part to fears US corporate earnings have peaked following the one-time surge from the 2017 tax cut legislation. The Dow Jones Industrial Average lost 1.19% on Friday. 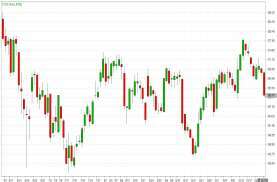 The best performers of the session on the Dow Jones Industrial Average were Intel Corporation, which rose 3.11% or 1.38 points to trade at 45.69 at the close. Meanwhile, Walgreens Boots Alliance Inc. added 0.65% or 0.49 points to end at 76.23 and Merck & Company Inc. was up 0.63% or 0.44 points to 70.40 in late trade. The worst performers of the session were Home Depot Inc., which fell 3.82% or 6.84 points to trade at 172.23 at the close. Cisco Systems Inc. declined 2.68% or 1.22 points to end at 44.25 and American Express Company was down 2.27% or 2.35 points to 101.25. The tech heavy NASDAQ index fell 2.07% on Friday. The top performers on the NASDAQ were Yulong Eco-Materials Ltd which rose 66.20% to 7.180, China Recycling Energy Corp which was up 19.55% to settle at 1.5900 and MYnd Analytics Inc. which gained 24.09% to close at 1.70. The worst performers were Synergy Pharmaceuticals Inc. which was down 69.29% to 0.430 in late trade, Flex Ltd which lost 35.01% to settle at 7.09 and MoSys Inc. which was down 30.50% to 0.2648 at the close. Crude oil futures posted their third consecutive weekly loss on Friday as the bulls that pushed oil prices to nearly four-year highs head into retreat. U.S crude ended this week down 2.2 percent and has now tumbled about 12 percent from its recent high of $86.74 on Oct. 3. 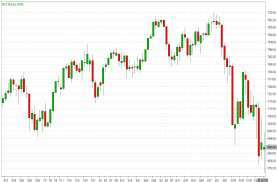 Crude futures have gotten swept up in a wider stock market rout this month, with most of the losses for oil coinciding with a sell-off in equities. But the narrative driving oil prices has also flipped in recent weeks, and traders are closing out bullish bets on the commodity. At the start of October, oil prices were rising on signs that U.S. sanctions are shrinking Iran’s crude exports faster than anticipated, potentially leaving the world with a shortage of oil. The sanctions are expected to cut crude exports from Iran, OPEC’s third-biggest oil producer, by about 1 million barrels per day. But concerns about faltering demand and rising output from OPEC and Russia now have traders focused on potential oversupply. Gold prices rose on Friday towards the three-month highs hit earlier this week as nervous investors retreated from stock markets and piled into the precious metal seen as a refuge from financial turmoil. Spot gold was up 0.3 percent at $1,235.16 an ounce having earlier this week hit $1,239.68, its highest since mid-July. It is on course for a fourth week of gains. U.S. gold futures rose 0.4 percent to $1,237.6 an ounce. Global stocks slid again on Friday and were set to post their worst weekly losing streak in more than five years. 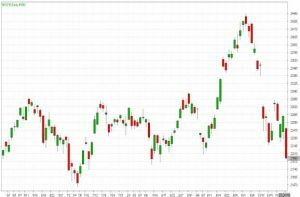 “The confusion in bond and stock markets is fuelling some interest in gold. If they continue to fall, that will give support to gold. You’ll then have trend buyers coming in and supporting the price. The bears are frightened of being caught on the wrong side. The liquidation of short positions on COMEX has the potential in the short term to drive gold up to between $1,260 and $1,270. Gold prices have gained more than 6 percent after falling to $1,159.96 an ounce in mid-August, their lowest since Jan. 2017. The release of U.S growth data earlier, which showed the economy slowed less than expected in the third quarter, had little lasting impact. Gold prices ticked down a little after the GDP report, but popped back up later. We are also seeing some more short-covering in the futures markets which is lifting prices. Investor flows into bullion, often considered a safe haven and store of value during times of financial, economic and geopolitical uncertainties, can be seen by the rise in holdings of physically-backed exchange traded products. Holdings in the world’s largest gold-backed exchange-traded fund, SPDR Gold Trust, saw outflows of about 4.5 million ounces between late April and early October. Gold’s impressive performance of late, coming amid U.S. dollar strength, suggests that gold finally is behaving like a safe-haven asset. 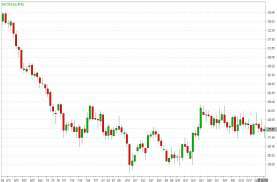 Wheat futures rose nearly 4 percent in Friday’s trading session and bounced back from multi-month lows a day earlier, buoyed by short-covering and indications that wheat was becoming more competitive globally. Corn futures rose on Friday, rebounding from Thursday’s two-week low, and soybeans rallied from a one-month low. The third quarter US gross domestic product data bettered forecasts this afternoon, clocking in at 3.5% on the quarter. 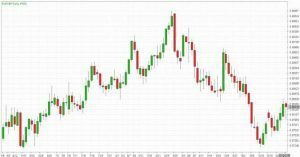 While this still represents a slowdown from the strong growth seen in the second quarter investors took encouragement from the data, pushing the US Dollar (USD) higher against its rivals. As the figure is likely to add further fuel to the hawkish outlook of the Federal Reserve the odds of a December interest rate hike remain high. The Euro remained under pressure after European Central Bank President Mario Draghi indicated the central bank could extend its asset purchase program. He said Thursday at the post-decision press conference that accommodation remained necessary. The central bank made no changes to its monetary policy, as expected. The US Dollar (USD) benefitted notably from the Euro’s weakness over the last week. While this has been the primary cause of USD gains, the US currency has also found support on recent US data which has continued to indicate that the economic outlook is strong. Thursday saw the publication of the US durable goods orders results from September, which beat forecasts by only falling from 4.6% to 0.8% rather than the predicted drop from 4.5% to -1%. US pending home sales from September were stronger too, climbing from -1.9% to 0.5% rather than the forecast -0.1%. Since the European Central Bank (ECB) decision has passed investors are turning their attention towards key data due for publication in this week. The British Pound ended the day almost flat against the Dollar. The Canadian dollar slumped to a six-week low against its U.S. counterpart on Friday before paring its decline, as a sell-off in global stock markets offset the boost the loonie got earlier in the week from a Bank of Canada interest rate hike. Stock markets around the world fell as better-than-expected U.S. economic data did little to ease anxiety over disappointing corporate profits and trade wars. Canada’s central bank on Wednesday raised its key interest rate by 25 basis points to 1.75 per cent, its fifth hike since July 2017, and said it might speed up the pace of future hikes given that the economy was running at almost full capacity and did not need any stimulus. 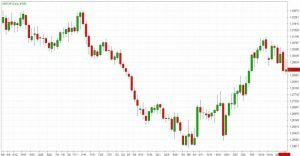 The single currency fell sharply across the board after ECB President Draghi’s press conference on Thursday, as it was revealed that while the QE program will end in December, that doesn’t mean other programs couldn’t be started up. There is no risk of contagion from Italy’s budget crisis in the EU but the euro zone is not prepared enough to face a new economic crisis, French Finance Minister said on Sunday. a high of 1.1419 before closing the day around 1.1399 in the New York session. The Japanese Yen was the best performing currency last week, extending its run as the best performer in October. 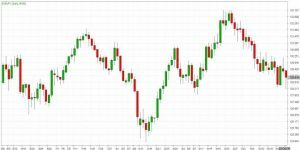 Friday’s price action among the JPY-crosses suggests exhaustion in the short-term, but weekly charts continue to point towards gains. Retail traders remain net-short the Japanese Yen, despite the whipsaw price action at the end of last week. Overall, the USD/JPY traded with a low of 111.35 and a high of 111.42 before closing the day around 111.89 in the U.S session. The British Pound fell to an over two-month low as risk aversion continued favoring the Dollar during the first half of the day, but finished the week at 1.2825, as the American currency eased on the back of a mixed Q3 GDP report and some profit-taking ahead of the weekend. UK’s Chancellor Philip Hammond warned that a no-deal Brexit will jeopardize budget plans. 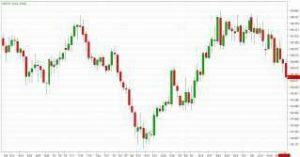 Overall, the GBP/USD traded with a low of 1.2775 and a high of 1.2839 before closing the day at 1.2828 in the New York session. The Canadian Dollar slumped to a six-week low on Friday before paring its decline, as a sell-off in global stock markets offset the boost the loonie got earlier in the week from a Bank of Canada interest rate hike. Canada runs a current account deficit and exports many commodities, so its economy could suffer if the flow of trade or capital slows. 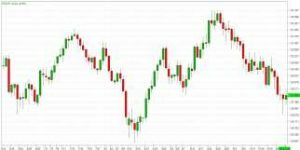 Overall, USD/CAD traded with a low of 1.3066 and a high of 1.3157 before closing the day at 1.3093 in the New York session. The Australian Dollar continued its death-spiral in early Friday trading session when it fell to a new two-year low but ended the session off its lows as the Greenback weakened and analysts are now looking to this week’s wage data for clues about where it will head next. 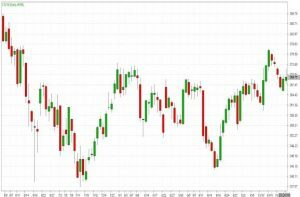 Third-quarter inflation data due out next week is unlikely to improve the Australian Dollar’s fortune, according to analysts at TD Securities. 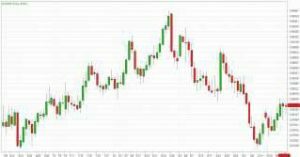 Overall, AUD/USD traded with a low of 0.7019 and a high of 0.7102 before closing the day at 0.7088 in the New York session. EUR/JPY is trading below 14 and above 50, 100 days moving average. Fast stochastic is giving a bullish tone and MACD is issuing a bearish stance. The Relative Strength Index is above 34 and lies below the neutral zone. In general, the pair has lost 0.20%. Currently, GBP/JPY is trading below 14 and above 50, 100 days moving average. Fast stochastic is issuing a bearish tone and MACD is also indicating a bearish stance. The Relative Strength Index is above 34 reading and lies below the neutral zone. On the whole, the pair has lost 0.35%. Currently, the cross is trading below 14, 50 and 100 days moving average. Fast stochastic is giving a bullish tone and MACD is indicating a bearish stance. The Relative Strength Index is above 40 reading and lies below the neutral region. In general, the pair has lost 0.30%. This cross is currently trading below 14, 50 and 100 days moving average. Fast stochastic is indicating a bullish tone and MACD is also issuing a bullish signal. The Relative Strength Index is above 57 and lies below the neutral region. On the whole, the pair has gained 0.13%. This cross is trading above 14, 50 and 100 days moving average. Fast stochastic is issuing a bearish stance and MACD is indicating a bullish tone. The Relative Strength Index is above 42 and lies above the neutral region. In general, the pair has lost 0.16%. 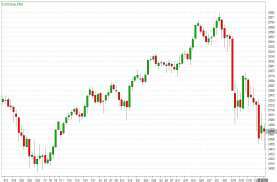 The sell-off in U.S. stocks accelerated, wiping out gains for the year in both the S&P 500 Index and the Dow Jones Industrial Average, as mixed corporate earnings and weak housing data fueled anxiety that rising prices will crimp economic growth. A slew of results this week is expected to throw spotlight on the risk of a slowdown in China, the world’s No. 2 economy, spilling beyond its borders and eating into U.S corporate profits. Chipmakers, already struggling with oversupply and reliant on China for a significant portion of profit, dropped after Texas Instruments forecast weak current quarter and STMicroelectronics signaled slowing demand in China. 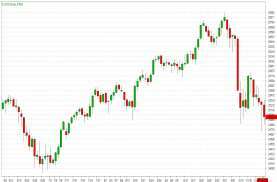 The Dow was down 251.89 points, or 2.41 percent, the S&P 500 .SPX was down 32.76points, or 3.09 percent and the NASDAQ was down 119.68 points, or 4.43 percent yesterday. While earnings from S&P 500 companies are expected to have increased about 22 percent in the third quarter, 2018 is seen as a peak for the profit cycle. 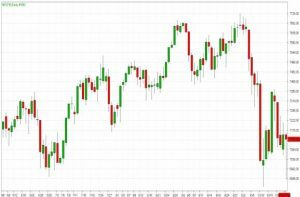 The Dow Jones Industrial Average fell 2.41% to hit a new 3-months low. 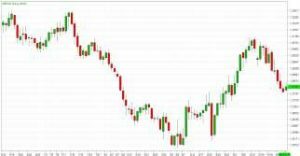 The best performers of the session were Procter & Gamble Company, which rose 2.64% or 2.30 points to trade at 89.46 at the close. Meanwhile, Boeing Co added 1.31% or 4.60 points to end at 354.65 and Coca-Cola Company was up 0.80% or 0.37 points to 46.73 in late trade. The worst performers of the session were United Technologies Corporation, which fell 6.11% or 7.95 points to trade at 122.07 at the close. Caterpillar Inc. declined 5.58% or 6.64 points to end at 112.34 and Microsoft Corporation was down 5.35% or 5.78 points to 102.32. 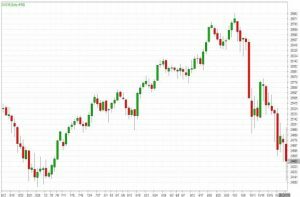 The NASDAQ index declined 4.43%. The top performers on the NASDAQ were National American University which rose 115.69%, Clementia Pharmaceuticals Inc. which was up 40.23% to settle at 14.50 and XpresSpa Group Inc. which gained 28.90% to close at 0.199. The worst performers were Ameri Holdings Inc. which was down 60.69% to 0.41 in late trade, Travelzoo Inc. which lost 31.33% to settle at 8.00 and Yulong Eco-Materials Ltd which was down 28.42% to 4.610 at the close. Oil prices yesterday clawed back some of their hefty losses from the day before as the looming U.S. sanctions against Iran came back into focus. U.S crude futures were at $66.58 a barrel, up 15 cents, or 0.2 percent, from their last settlement. Saudi Energy Minister Khalid al-Falih said on Tuesday that despite expected supply disruptions from U.S sanctions against Iran that kick in from Nov. 4, Saudi Arabia would step up to meet any demand that materializes to ensure customers are satisfied. In China, Iran’s biggest oil buyer, the Bank of Kunlun is set to stop handling payments from the Islamic Republic next month, appearing to bow to U.S pressure. Kunlun is controlled by the financial arm of state-owned China National Petroleum Corp and is the main official channel for money flows between China and Iran. With financial ties between the two countries effectively severed from November, Chinese oil firms will need to find alternatives to Iran’s crude. China took in 800,000 barrels per day from Iran in August. Gold eased yesterday as the dollar firmed and speculators locked in profits from a more than three-month peak hit in the previous session. 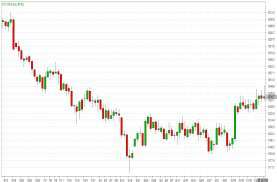 Losses were modest, however, as gold got support from investors looking for insurance from potential further downside in stock markets after five days in the red. Spot gold was down 0.2 percent at $1,228.06 an ounce. U.S gold futures were down 0.4 percent at $1,231.50 an ounce. On Tuesday, the precious metal touched its highest since July 17 at $1,239.68 as investors took cover from a stock selloff. The dollar index versus a basket of currencies rebounded 0.4 percent and hit its highest since Aug. 17 at 96.53. The most important reason is a little bit of a rebound in the U.S. dollar, which has a negative effect on gold. On top of that, following a strong performance we had in gold in the past few days, this may be a little bit of profit taking, although this should not be the end of the recovery in gold. Gold prices have gained more than 6 percent after falling to $1,159.96 an ounce in mid-August, their lowest since January last year. After reaching a three-month high, gold is taking a breath but the environment remains positive for bullion, with growing investor interest for the precious metal among those betting on further corrections of stock markets increases. World stocks steadied after falling for five straight days, pressured by earnings disappointment, concerns over Italy’s budget and worries that world economic growth is losing steam. Gold is focusing on the risk aversion creeping into the market, especially reflected in the weakness seen in global stock markets. Dollar-denominated gold is often used as an alternative investment during times of political and financial uncertainty. If there is a correction, then $1,210 is a good support zone; breaching this support may lead gold to fall further towards $1,195, which is less likely in the current scenario. Silver was down 0.5 percent at $14.66 an ounce, while platinum slid 0.9 percent to $823 an ounce. 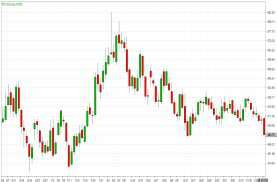 Wheat futures fell 2 percent yesterday, dropping below $5 a bushel for the first time in nearly six weeks as analysts cited technical selling mixed with worries about U.S export prospects. The dollar remained near nine-week highs against other currencies yesterday, while the loonie surged after the Bank of Canada increased rates. The U.S dollar index, which measures the greenback’s strength against a basket of six major currencies, was up 0.46% to 96.15. The Canadian dollar was higher, with USD/CAD down 0.47% t0 1.3022 after the Bank of Canada increased interest rates to 1.75% from 1.50%, as expected. The dollar inched up against the Japanese yen, with USD/JPY up 0.05% to 112.49. Meanwhile the euro was at its lowest level since August 17, after data showed that euro zone private sector activity grew at the slowest pace in more than two years in October, increasing concerns over the economic impact of trade wars. Worry over Italy’s budget also remained in focus after the European Union took the unprecedented step of rejecting Rome’s 2019 draft budget on Tuesday, amid concerns over the impact of increased spending on already high national debt levels. Sterling remained under pressure as Brexit talks stalled just five months until the UK is scheduled to leave the EU. The pound was near one-and-a-half month lows, with GBP/USD falling 0.62% to 1.2903. The Canadian dollar strengthened to a one-week high against its U.S. counterpart yesterday after the Bank of Canada opened the door to a faster pace of tightening as it raised interest rates, as expected, for the fifth time since July 2017. The central bank increased its key interest rate by 25 basis points to 1.75 per cent and said it would continue to hike to at least 2.5 per cent to keep inflation in check, while it dropped previous references to a gradual pace of tightening. The Canadian dollar is reacting to the removal of gradual from the Bank of Canada statement. The central bank targeted a neutral stance for interest rates, which it estimates to be between 2.5 per cent and 3.5 per cent. Money markets implied a policy rate of 2.43 per cent in December 2019, up from 2.37 per cent before the rate announcement. Gains for the loonie came even as the Dollar climbed to its highest in more than two months against a basket of other major currencies. 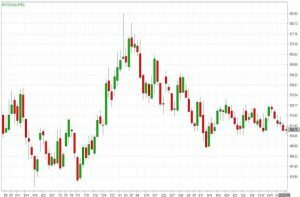 The single currency fell and the bloc’s government bond yields dropped after data showed business growth in the single currency area lost far more momentum than expected, as trade tensions and worries over Italy overshadow the economy. A survey showed euro zone business growth decelerated faster than anticipated as the final quarter of 2018 began. 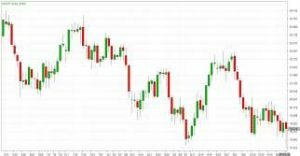 Overall, the EUR/USD traded with a low of 1.1377 and a high of 1.1475 before closing the day around 1.1390 in the New York session. The Japanese Yen pair strengthened after European data signaled that economic growth could be flagging across the euro zone. Weakness in the single currency supported the dollar index. 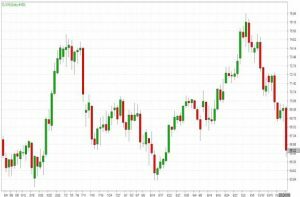 The Japanese yen, often bought when broader markets slide, gave up its earlier gains, suggesting some renewed demand for risk-taking as stock markets rebounded. Overall, the USD/JPY traded with a low of 112.07 and a high of 112.72 before closing the day around 112.23 in the U.S session. The British Pound was under pressure against the dollar amid reignited fears about the possibility of a no-deal Brexit. The three-week low for sterling against the dollar comes amid revived dollar strength and continued fears about the progress of Brexit negotiations in Britain. Concerns are growing about the possibility and severity of a no-deal Brexit. Overall, the GBP/USD traded with a low of 1.2865 and a high of 1.2989 before closing the day at 1.2879 in the New York session. The Canadian Dollar spiked up against its major counterparts yesterday, as the Bank of Canada lifted its benchmark rate by a quarter point, as expected. The BoC hiked its overnight rate to 1.75% from 1.50%. The decision was in line with forecasts. The bank said that it expects inflation to remain close to the 2% target through the end of 2020. 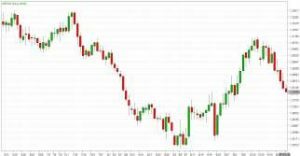 Overall, USD/CAD traded with a low of 1.2966 and a high of 1.3097 before closing the day at 1.3053 in the New York session. 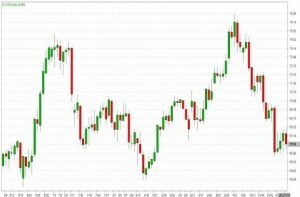 The Australian Dollar rose into the yesterday’s mid-week session as it tracked the Chinese stock market in its recovery off multi-year lows, and analysts at both Westpac and Commerzbank are suggesting it could move higher still. 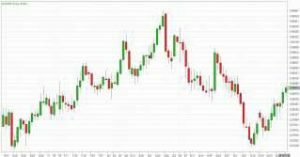 But was unable to hold on to its gains and ended the day slightly lower against the Dollar Overall, AUD/USD traded with a low of 0.7066 and a high of 0.7104 before closing the day at 0.7068 in the New York session. EUR/JPY is trading below 14 and above 50, 100 days moving average. Fast stochastic is giving a bullish tone and MACD is issuing a bearish stance. The Relative Strength Index is above 37 and lies below the neutral zone. In general, the pair has lost 0.86%. Currently, GBP/JPY is trading below 14 and above 50, 100 days moving average. Fast stochastic is issuing a bearish tone and MACD is also indicating a bearish stance. The Relative Strength Index is above 38 reading and lies below the neutral zone. On the whole, the pair has lost 0.96%. Currently, the cross is trading below 14, 50 and 100 days moving average. Fast stochastic is giving a bullish tone and MACD is indicating a bearish stance. The Relative Strength Index is above 40 reading and lies below the neutral region. In general, the pair has lost 0.52%. This cross is currently trading below 14, 50 and 100 days moving average. Fast stochastic is indicating a bullish tone and MACD is also issuing a bullish signal. The Relative Strength Index is above 50 and lies above the neutral region. On the whole, the pair has gained 0.09%. This cross is trading above 14, 50 and 100 days moving average. Fast stochastic is issuing a bearish stance and MACD is indicating a bullish tone. The Relative Strength Index is above 46 and lies above the neutral region. In general, the pair has lost 0.49%. The U.S Dollar fell yesterday after Wall Street opened lower, spurring a risk-off move that benefited the safe-haven Japanese yen and Swiss franc against the greenback. The stock market has everyone’s attention. The dollar/yen is moved tick-to-tick with stocks. Although the dollar is also considered a safe-haven currency, weakness in U.S. markets will nevertheless disadvantage the greenback against other safe havens. Markets are starting to wonder if the good times generated from Trump’s tax cuts and deregulation are in the rear view mirror and what’s ahead is fallout from protectionist policies, and that has started to eat into corporate earnings. 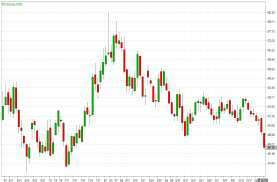 The euro fell after the European Commission rejected Italy’s 2019 budget and said it will ask Rome to present a new document within three weeks, according to reports from Italian news agency AGI, citing EU sources. The dispute over Italy’s spending plans and doubts about the leadership of Britain’s prime minister, who is mired in a stalemate over Brexit, has investors focusing on the likelihood of further political turmoil in Europe. Worries about Italy’s spending have bred some doubt about the European Central Bank’s plan to raise interest rates next summer, and that too has hurt the euro. Britain’s pound traded up in the European session before retracing those gains after falling precipitously on Monday over fears that the Northern Ireland border issue and disagreements within Britain’s ruling Conservatives over Brexit could cause Prime Minister Theresa May to face a serious leadership challenge. The yen strengthened yesterday as a slew of geopolitical risk factors bolstered safe haven demand for the Japanese currency, while the dollar dipped against a currency basket. A rally in Chinese equities reversed overnight, pulling down European stocks and U.S futures amid renewed worries over a host of economic and geopolitical issues. Concerns over the U.S.-China trade war and political uncertainty in Europe also weighed. The Japanese currency is often sought by investors for its relative safety during periods of economic or geopolitical uncertainty. The single currency ended yesterday’s session slightly higher. Euro zone consumer sentiment rose slightly in October, against expectations of a decline, according to figures released yesterday. The European Commission said a flash estimate showed euro zone consumer morale increased to -2.7 points in October from -2.9 points in September. 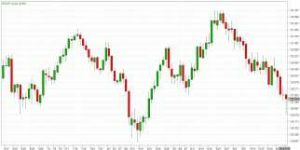 Overall, the EUR/USD traded with a low of 1.1438 and a high of 1.1492 before closing the day around 1.1469 in the New York session. The Japanese Yen pair came under a renewed selling pressure in the early trading hours yesterday and fell to a fresh five-day low before recovering slightly. With the flight-to-safety becoming the primary driver of the market action yesterday, the JPY stays strong against its peers. The US Dollar Index continues to fluctuate in a tight range Overall, the USD/JPY traded with a low of 111.93 and a high of 112.82 before closing the day around 112.42 in the U.S session. The British Pound rallied to the top of the leaderboard yesterday as the pendulum swung back in favor of a Brexit deal being struck by year-end. 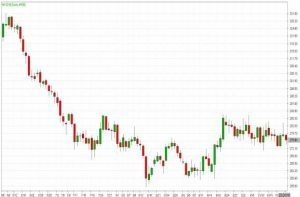 The British Pound remains highly attuned to sentiment on Brexit talks, and news of progress inevitably has seen the currency attract a bid. The market is again showing Brexit deal optimism. Overall, the GBP/USD traded with a low of 1.2935 and a high of 1.3042 before closing the day at 1.2928 in the New York session. The Canadian Dollar edged lower earlier yesterday as oil and stock prices declined, although the loonie traded in a narrow range ahead of a Bank of Canada interest rate decision today. Canada runs a current account deficit and exports many commodities, including oil, so its economy could be hurt if the global flow of trade or capital slows. 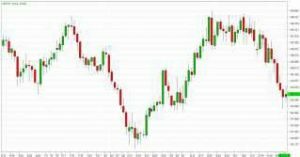 Overall, USD/CAD traded with a low of 1.3073 and a high of 1.3120 before closing the day at 1.3081 in the New York session. 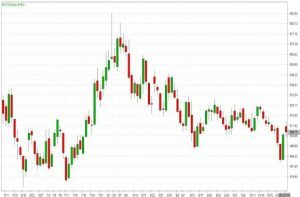 The Australian Dollar has endured a soft start to the week after the government lost a one-seat majority in parliament and as the U.S criticized China’s response to efforts at de-escalating the so called trade war between the world’s two largest economies. Australia’s ruling coalition lost its majority in the House of Representatives Saturday. 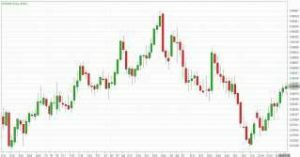 Overall, AUD/USD traded with a low of 0.7053 and a high of 0.7088 before closing the day at 0.7086 in the New York session. EUR/JPY is trading below 14 and above 50, 100 days moving average. Fast stochastic is giving a bullish tone and MACD is issuing a bearish stance. The Relative Strength Index is above 41 and lies below the neutral zone. In general, the pair has lost 0.27%. Currently, GBP/JPY is trading below 14 and above 50, 100 days moving average. Fast stochastic is issuing a bearish tone and MACD is also indicating a bearish stance. The Relative Strength Index is above 43 reading and lies below the neutral zone. On the whole, the pair has lost 0.20%. Currently, the cross is trading below 14, 50 and 100 days moving average. Fast stochastic is giving a bullish tone and MACD is indicating a bearish stance. The Relative Strength Index is above 41 reading and lies below the neutral region. In general, the pair has lost 0.29%. This cross is currently trading below 14, 50 and 100 days moving average. Fast stochastic is indicating a bullish tone and MACD is also issuing a bullish signal. The Relative Strength Index is above 49 and lies above the neutral region. On the whole, the pair has lost 0.06%. This cross is trading above 14, 50 and 100 days moving average. Fast stochastic is issuing a bearish stance and MACD is indicating a bullish tone. The Relative Strength Index is above 51 and lies above the neutral region. In general, the pair has gained 0.01%. Wall Street came off its session lows yesterday as the wave of selling that started in Asia and which rippled through European and US markets abated somewhat in afternoon trade. 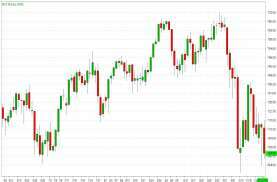 With about 90 minutes to go before the closing bell, the S&P 500 is down 0.7 per cent after having pulled back from a decline of 2.3 per cent that briefly pushed it to a five-month low. 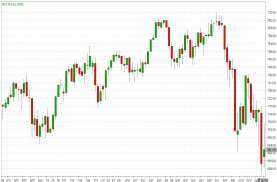 The Dow Jones Industrial Average cut a 2.2 per cent loss to just 0.5 per cent while the NASDAQ was sitting 0.7 per cent lower following a 2.8 per cent slide earlier yesterday. U.S stocks endured a brutal October as rising interest rates, trade tensions and slowing global growth soured sentiment. Investors were further rattled yesterday after two US industrial bellwethers — 3M and Caterpillar — issued disappointing outlooks and raised fears that corporate earnings have peaked. The sell-off was not limited to equities. Crude prices suffered their biggest one-day drop in three months as jitters over global growth outlook. The Dow Jones Industrial Average fell 0.50%. 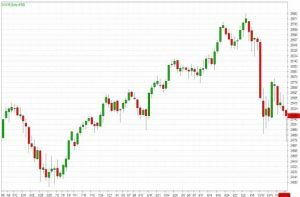 The best performers of the session on the Dow Jones Industrial Average were McDonald’s Corporation, which rose 6.31% or 10.52 points to trade at 177.15 at the close. 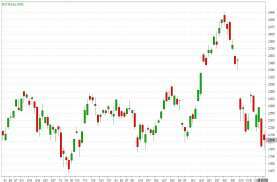 Meanwhile, Verizon Communications Inc. added 4.06% or 2.23 points to end at 57.21 and United Technologies Corporation was up 2.86% or 3.62 points to 130.02 in late trade. The worst performers of the session were Caterpillar Inc., which fell 7.56% or 9.73 points to trade at 118.98 at the close. 3M Company declined 4.38% or 8.81 points to end at 192.55 and Chevron Corp was down 3.25% or 3.81 points to 113.40. The NASDAQ index lost 0.42%. The top performers on the NASDAQ were Cinedigm Corp which rose 53.93% to 1.3700, Titan Pharmaceuticals Inc. which was up 36.36% to settle at 0.4800 and Realm Therapeutics PLC ADR which gained 32.07% to close at 2.86. The worst performers were Selecta Biosciences Inc. which was down 33.36% to 8.87 in late trade, Astec Industries Inc. which lost 24.88% to settle at 35.51 and One Horizon Group Inc. was down 22.31% to 0.2618 at the close. Oil prices fell more than 4 percent yesterday, pressured by stock market weakness and vows by top oil exporter Saudi Arabia to meet the demands of the world’s oil consumers. U.S crude ended yesterday’s session down $2.93, or 4.2 percent, to $66.43 a barrel, after earlier hitting a two-month low at $65.74. 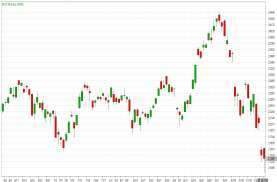 The contract posted its biggest daily loss since July 11, when it fell 5 percent, and settled below its 200-day moving average for the first time in more than a year. The correlation between oil prices and broader market trading was a driving factor and the volatility in both is enough of a reason to take some money off the table. Traders have been trimming bets that oil prices will rise in recent weeks, a sign the market is reducing its exposure to risk and taking profits after a run up in oil prices. U.S crude and Brent have both fallen by about $10 from their nearly four-year closing highs on Oct. 3. The prospect of weaker-than-expected economic growth has already led some forecasters to trim their expectations for oil demand. 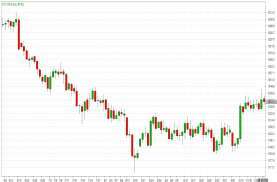 Gold rose 1 percent yesterday to its highest level in over three months as the dollar weakened and global stock markets tumbled, with rising political and economic uncertainties adding to bullion’s appeal. Palladium soared to a record high, bringing the precious metal to within striking distance of achieving parity with gold and with additional support from expected renewed demand from China’s automotive sector. Spot gold was up 1 percent at $1,233.21 an ounce, having earlier touched its highest since July 17 at $1,239.68. U.S. gold futures rose 0.9 percent to $1,236.10, also helped by positive currency fundamentals as the dollar turned lower. It was the selloff in the stock markets yesterday and a weaker dollar which helped gold prices. The main thing to watch on gold is the turbulence in the equity markets, especially if it is sustained. If you get continued declines like this, gold should pick up. Wall Street followed a slide in European and Asian stock markets, pressured by disappointing corporate earnings, Saudi Arabia’s diplomatic crisis and a dispute over Italy’s finances. The European Commission rejected Italy’s draft 2019 budget yesterday, saying it brazenly broke EU rules on public spending and asked Rome to submit a new one within three weeks or face disciplinary action. The outlook for gold is quite constructive with the metal quite resilient even with a strong dollar. Gold prices have gained more than 6 percent after falling in mid-August to $1,159.96 an ounce – their lowest since January 2017. Holdings at SPDR Gold Trust, the world’s largest gold-backed, exchange-traded fund, rose 0.3 percent on Monday to 747.88 tonnes. Investors consider gold a safe store of value during times of economic and political uncertainty. Meanwhile, palladium was up 1.8 percent at $1,141.49 an ounce after hitting a record $1,150.50. Among other precious metals, silver rose 0.8 percent to $14.72, while platinum was up 1.6 percent at $832.80. Soybean futures fell in yesterday’s trading session to a near two-week low after the U.S Department of Agriculture pegged the pace of harvesting above market expectations, though forecasts for rain provided a floor to losses.